Wizards Storage Portal was upgraded on December 23rd. The upgrade to 3.30.0 contains extensive new TSM Server Grouping functionality, design modifications as well as minor bugfixes and performance enhancement. 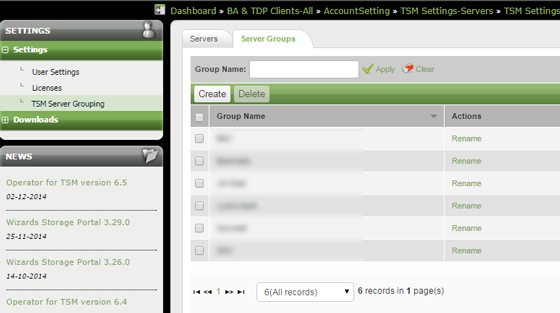 From version 3.30 support for TSM Server Grouping has been added. The groups are created and configured in the Settings > User Settings section where groups can be created and named. Subsequently servers can be assigned to and removed from the created groups. The groups will then be available as a global filter in the Object View section of WSP where they can be selected and deselected at will, while maintaining the single server selection functionality. Enhanced performance of the SLA widget on the Dashboard. Several design-related optimizations and various minor bugfixes.